K2HR3 (K2Hdkc based Resource and Roles and policy Rules) is one of extended RBAC (Role Based Access Control) system. 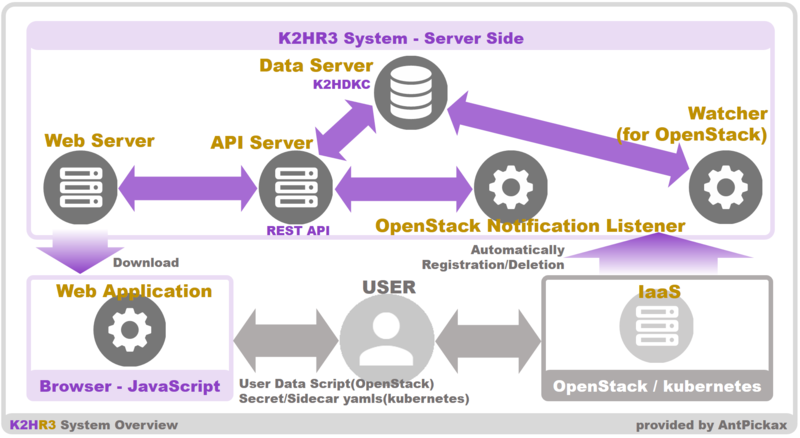 K2HR3 works as RBAC in cooperation with OpenStack which is one of IaaS(Infrastructure as a Service), and also provides useful functions for using RBAC. 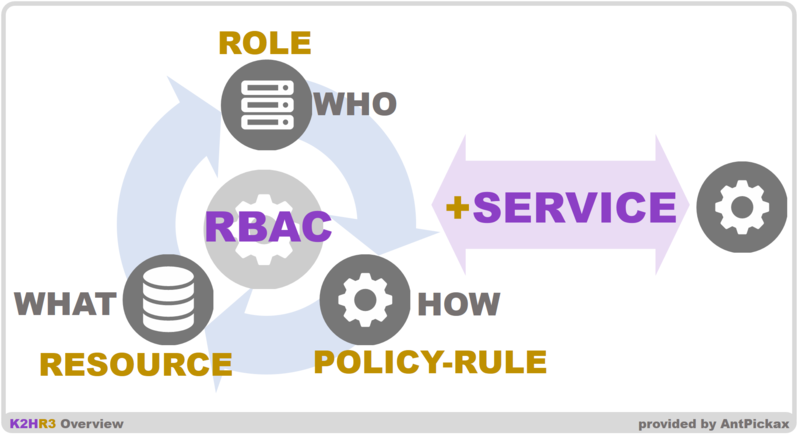 K2HR3 is a system that defines and controls HOW(policy Rule), WHO(Role), WHAT(Resource), as RBAC. Users of K2HR3 can define Role(WHO) groups to access freely defined Resource(WHAT) and control access by policy Rule(HOW). By defining the information and assets required for any system as a Resource(WHAT), K2HR3 system can give the opportunity to provide access control in every situation. K2HR3 provides +SERVICE feature, it strongly supports user system, function and information linkage. K2HR3 is built k2hdkc, k2hash, chmpx and k2hash transaction plugin components by AntPickax. K2HR3 REST API provides for manipulating data such as ROLE, POLICY RULE, RESOURCE and SERVICE stored in the K2HR3 Data Server(k2hdkc). Using the K2HR3 REST API provided by this K2HR3 API server, the K2HR3 Web Application and its Web Server communicates with the K2HR3 Data Server(k2hdkc). And users and hosts of the ROLE member directly call this K2HR3 REST API on this K2HR3 API Server, and get/put RESOURCE data. K2HR3 is one of AntPickax products. Copyright(C) 2017 Yahoo Japan Corporation.